Perceptual features new works by Lucas Artist Fellows Chris Fraser and Justin Lowman that explore the relationship between perception, light, space, and place. 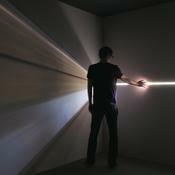 San Francisco-based Fraser creates relational environments and sculptures where viewers’ bodies interact with and transform paths of light. Inspired by proto- photographic and cinematic experiments, such as the camera obscura, his work often explores the relationship between action, movement and visual perception. For Perceptual, Fraser has created an animated sculptural environment using a circle of lights suspended above a shallow metallic cylinder on the gallery floor. Light reflects off the cylinder’s mirrored surface to create a pool of overlapping and intertwining luminous arcs. 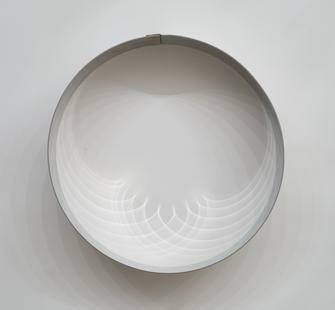 Recalling the zoetrope, a pre-cinematic animation device, or a sundial, the light patterns shift and alter as visitors move around and peer into the vitalized metal ring. The light and material conditions of specific places serve as inspiration for Los Angeles-based Justin Lowman. Using electrical light and sound sources, reflective surfaces and found, constructed and painted elements, his installations and objects frequently infuse vibrant colored light into architectural settings. 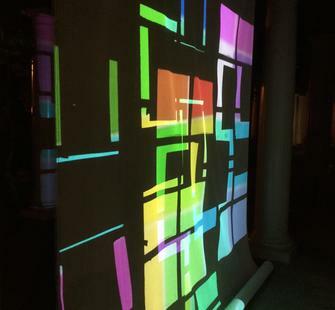 Lowman has produced an installation for Perceptual that he describes as a temporal multidimensional painting. Focusing on the threshold space of the gallery doorway, he uses projected and reflected light, scrim, paint and sound to blur the boundaries between interior and exterior space. Consistent with Lowman’s interest in the relationship between sensorial perception and duration, the color, timbre and texture of his environment transforms as a day progresses. 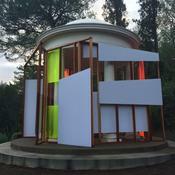 This exhibition is organized by the Lucas Artists Residency Program at the Montalvo Art Center.